A major initiative aimed at raising the profile of green spaces in the Canterbury district has received a boost with the release of a new film by a Kent environmental historian. Dr Karen Jones of the University’s School of History, working with Dr Eirini Saratsi of its School of Anthropology and Conservation, helped launch the Growing Canterbury’s Green Heritage initiative in October 2018. The film provides a campaigning focus for those working on environmental and green space projects in the district. Please read the full article here: https://www.kent.ac.uk/news/society/21009/university-helps-map-environmental-way-forward-with-green-heritage-film#. Senior Lecturer at University of Kent, Dr Emily Guerry, has recently appeared on a BBC One documentary offering her knowledge and expertise on Medieval History. The documentary, Danny Dyer’s Right Royal Family, follows British TV actor and personality, Danny Dyer, as he discovers his royal ancestry. Dr. Guerry reveals to Dyer that he is distantly related to the French King Louis IX, a devout religious leader who died in 1270. Danny Dyer’s Right Royal Family aired on 23 January and is now available to watch on BBC iPlayer, or alternatively read about it here: https://www.theguardian.com/film/2019/jan/14/danny-dyer-discovers-more-royal-ancestry-with-french-king-saint-louis. Recent history graduate George Evans-Hulme gives his top tips and advice on how to get the most out of your history degree. George’s article for History Extra includes a day in the life of an undergraduate, information on how much reading is involved and what opportunities a history degree can give you. He also advises how best to progress. You can read his article here: https://www.historyextra.com/period/history-degree-study-university-tips-advice/ . 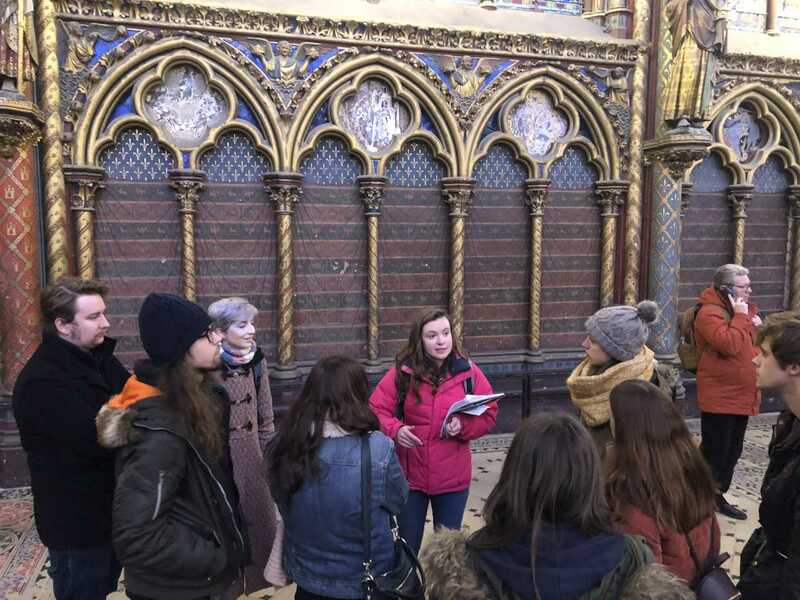 From 11–13 December 2018, Dr. Emily Guerry led a group of twelve third -year students from her Saints, Relics, and Churches and Gothic Art modules on an exciting fieldtrip to Paris. She was joined by two of her PhD students, Mr Noah Smith and Mx Han Tame, who work as GTAs in the School of History and who provided invaluable support throughout the excursion. Together, they visited the Basilica of Saint-Denis, the cathedrals of Notre -Dame de Paris and Notre-Dame de Chartres, and the Sainte-Chapelle to marvel at medieval design and engineering. They also went to the Musée du Louvre, Musée du Cluny, and the Cité d’Architecture et du Patrimoine to examine dozens of medieval objects crafted in wood, stone, plaster, glass, gems, gold, and ivory. 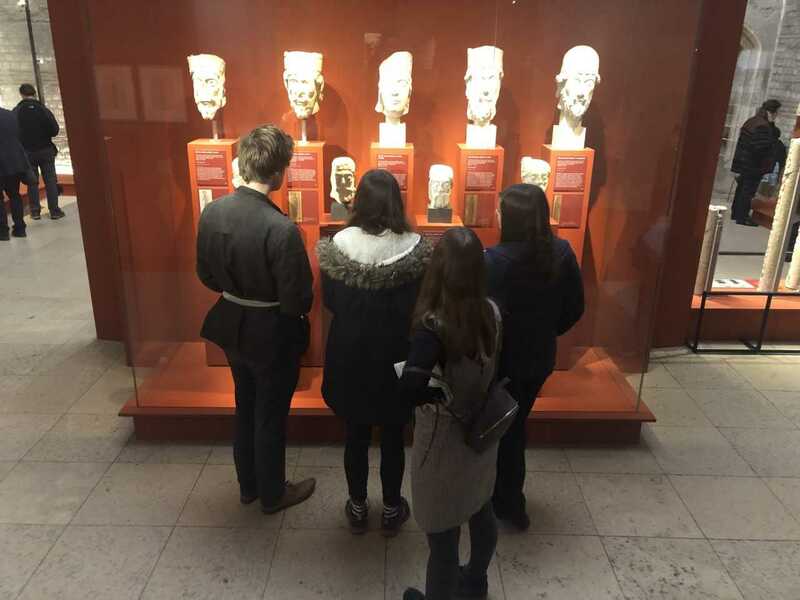 The fieldtrip was an astonishing success as it enhanced and enriched the students’ understanding of the source material through close encounters with the sites and things we examined in our modules. We would like to express our heartfelt gratitude to the School of History and the University of Kent Internationalisation fund for supporting this once-in-a-lifetime educational experience for our third-year students. 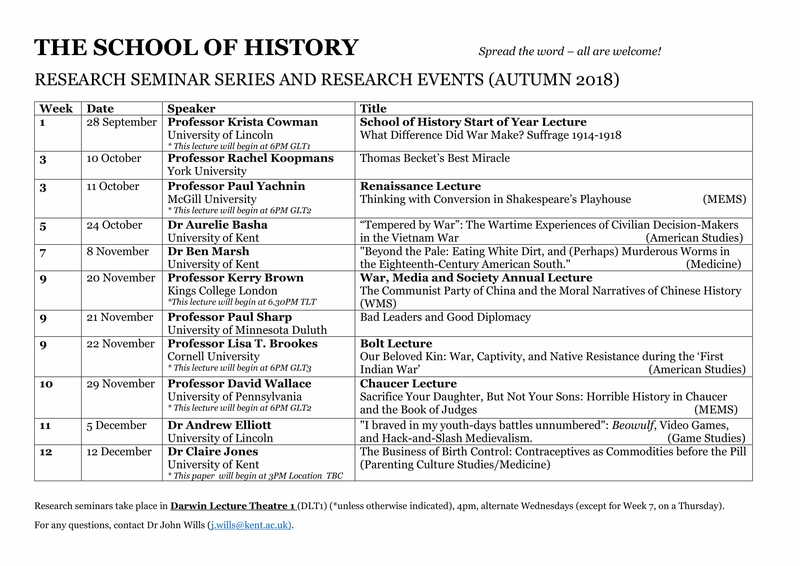 The School of History is delighted to invite you to attend our annual History Festival Lecture, which will take place in Darwin Lecture Theatre 1 on Wednesday 13 Februrary at 4PM, to be followed by a wine reception. Our speaker is Professor Matthew Gabriele, who is the Chair of the Department of Religion and Culture at Viriginia Tech University. His research examines the history of religion and violence in the Middle Ages as well as the modern world. This include events and ideas such as the Crusades, apocalyptic expectation, religion, and politics. He is also a public advocate against the galvanization of Medieval Studies by members of the alt-right in America. He has contibuted a number of articles on this topic in The Washington Post and Forbes.He is also a correspondant for CNN and National Public Radio, where he reports on the interface of fascism and medievalism today. 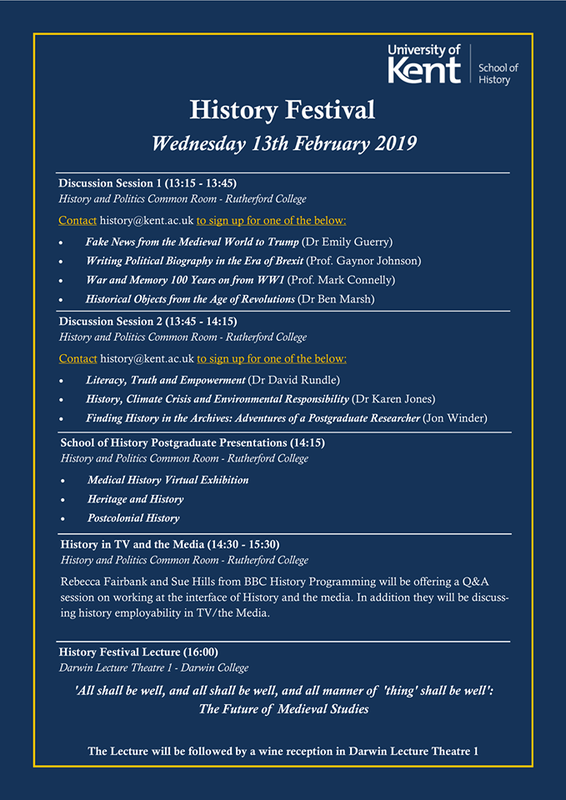 The School of History at the University of Kent is delighted to invite you to attend our annual History Festival on Wednesday 13 February 2019. All are welcome to attend! 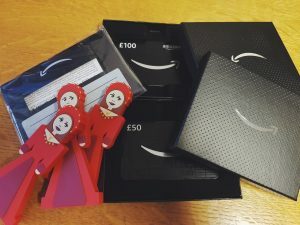 Thanks to everyone that entered our essay competition following our recent History at Kent Day. Entrants were required to write 200 words on ‘Who do you think is the most influential figure in history?’, and we received some fantastic entries! Congratulations! The prizes are in the post now. Hope you have a good start to the new term! 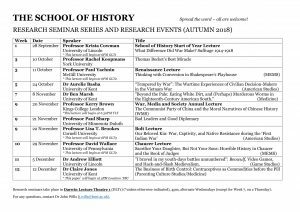 Check out our programme for the Research Seminar Series and Research Events (Autumn 2018). Spread the word, and join us!